Hey! Seriously these MyChips Salted Egg Potato Chips & Fish Skin Crisps are so addictive. Once I start I can’t stop till I finished the whole pack. Oh well, salted egg is becoming more popular, the salted duck egg with its strong salty flavor that is able to blend in with all kind of cuisines to create a unique taste. MyChips is one of the pioneer in creating the salted egg potato chips in Malaysia. Here are the 4 types of snacks that are available at MyChips the Slated Egg Potato Chip Original, Slated Egg Potato Chip Spicy, Slated Egg Potato Chip Durian and Salted Egg Fish Skin Crisps. I really love the unique salted egg flavor and the refreshing crispness of the potato chip combination is unstoppable. I love the Slated Egg Potato Chip Spicy and also their Salted Egg Fish Skin Crisps both are so satisfying. MyChips is owned by Malaysia and also produced in Malaysia. It uses all natural ingredients, doesn’t have any flavoring or essence. MyChip uses the finest quality of salted eggs (AA) grade, quality imported potatoes, aromatic curry leaves, and premium quality dried chilies to produce their product. Plus their snacks are produced in a highly hygenic kitchen environment with professional setup. MyChips care for your health, all their chips are oven roasted, not oil fried. The taste has been fine tuned to perfect combination of aroma, taste and aesthetic plus it’s endorsed by Chef TJ Tan, an International Renown Chef. 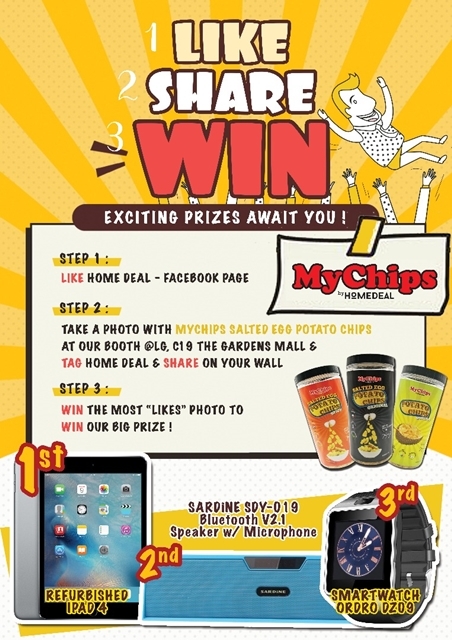 You know, MyChips is giving away awesome prizes such as iPad4, Bluetooth speakers & microphones, smart watches and others. All you need to do is to follow these 3 simple steps. 2. Take a photo with MyChips Salted Egg Potato Chips at their booth at LG-C19, The Gardens Mall, tag Home Deal and share on your wall. 3. The most like will win. Remember to join and make sure you set your profile to public. All the best! OMG I like fish-skin chips so much! And this is gonna be so interesting with three different flavours! Gonna try it very soon lah macam ni! Wow. Nampak sedap. Potato chips original pilihan eiza. Wow! It's the first time I've heard of this potato chips flavour, and I already feel like I wanna try out the salted egg. definitely an out of this world kinda chips. Would definitely try it out if I ever hit the Gardens! Oh my God! I'm crazy over anything that's salted egg. From chips to fries to fish skin. And hands down fish skin is my favourite. Ahhaaa got contest! Okay, this I must join! Haha..
We have tried to eat that Fish Skin is delicious and there are so many delicious flavors sometimes lazy while eating watching tv hehehe .. I pernah juga rasa this one. Inovasi dia macam fruits chips but this one lagi sedap.